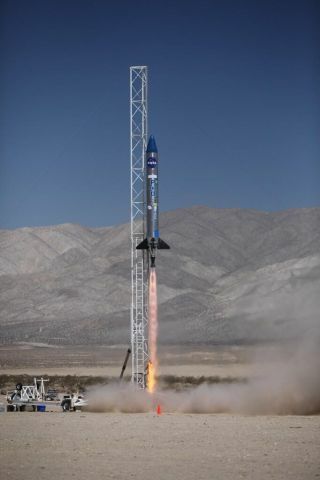 MOJAVE DESERT, Calif. — Saturday was a good day for a launch at the Friends of Amateur Rocketry test site here near the community of Cantil. The skies were clear blue, the winds light and the temperature was hot but not scorching. At 10:52 a.m. local time (1:52 p.m. EDT; 1752 GMT) on Saturday (June 15), the countdown reached zero and a Prospector-18D rocket carrying four tiny CubeSats rose on a column of orange flames along its vertical launch rail. The Prospector never got there. As the rocket, built by Garvey Spacecraft Corp., was still soaring skyward, a bright orange parachute suddenly deployed at the bottom. As the chute and the rocket's fins were ripped free by aerodynamic forces, the rocket pitched over and crashed into the desert floor less than 0.5 miles (0.8 kilometers) from its launch pad. Anyone who saw the launch and the badly damaged rocket lying amid the sagebrush might be excused for thinking that the flight had failed. However, the purpose of the NASA-sponsored mission was to test the CubeSats under flight conditions at high altitudes to see if they're ready to launch into orbit next year. And a flight had taken place. Curtis Williams, an engineer from NASA's Kennedy Space Center (KSC) in Florida who was tracking the Prospector from a location about 2 miles (3.2 km) away, said he lost track of the rocket at around 10,000 feet (3,050 meters), which was likely when it pitched over and headed for the ground. This was somewhat short of the expected peak altitude of 15,000 to 20,000 feet (4,570 to 6,100 m). As Williams and other engineers examined the wreckage, they had two questions: Had the payloads survived the crash? And what data could be extracted from them? After a crew led by Garvey Spacecraft CEO John Garvey rendered the Prospector safe, the rocket was brought by tractor to the Friends of Amateur Rocketry's main building for examination. A mangled Rocket University Broad Initiatives CubeSat — a.k.a., RUBICS-1 — was extracted from the badly damaged nosecone. RUBICS-1 featured a low-cost avionics system for use on future Garvey rockets that had been built by engineers at KSC. The tiny satellite included a GPS unit, radio and antenna and a small suite of sensors. Williams and his KSC team were able to retrieve the data card from the CubeSat, but they were unable to read it immediately. Williams said he hoped to pull data off the device when they got back to the lab. PhoneSat, which was built from a standard smartphone by engineers at NASA's Ames Research Center in Moffett Field, Calif., was also mangled by the rocket's impact with the ground. However, it fared somewhat better in that it was transmitting data to the ground. Engineers said they got good data during the early part of the flight. Another PhoneSat flew into space this past April on the maiden launch of the private Antares rocket, which aerospace firm Orbital Sciences will use to launch unmanned cargo missions to the International Space Station for NASA. The other two CubeSats were in much better condition. StangSat, built by students from Merritt Island High School in Florida, and California Polytechnic Institute in San Luis Obispo's PolySat were both housed just below the nosecone in a poly-picosat orbital deployer (P-POD). This rugged, spring-loaded container, which is used to deploy CubeSats into orbit from larger launch vehicles, protected the two payloads from serious damage. StangSat and PolySat contained instruments designed to gather and record flight data during the flight. Although the two payloads were located right next to each other in the P-POD, they communicated between themselves via Wi-Fi, which was a first for CubeSats. Despite the launch anomaly, officials were upbeat about the flight. Garrett Skrobot, project manager for the demonstration mission under NASA's Launch Services Program, said the flight produced valuable information. "We did receive data from the instruments and payloads that were on board ... We consider it more of a success because we were able to get the data despite the situation," Skrobot said. "Once we get the data, we'll determine exactly the effect on the vehicle."